Sittin 'n Knittin: where did June go? There are some scattered beads worked into the pattern, and I'm happy with the subtleness of the beads I chose. However, when I realized that the point of the stole is anchored by a bead, I used a larger frosted quartz bead and like the look very much. I am assuming the stole will be a big ol' rectangle that happens to have triangular ends, so I do have a similar bead reserved for the other end of the stole. Today I completed row 86 with only 14 more rows to go until Friday when clue #2 will be available. Too lazy to take another picture right now. 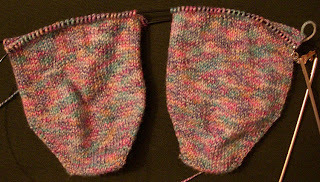 Regia Bamboo anklets, about 2 inches to go before I start the heels. 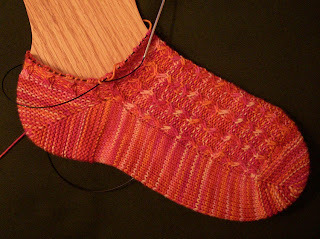 the Solstice Slip pattern is really simple and I find myself grabbing it when I'm out and about over the plain stockinette anklets, so slow progress on them. But they will all get done at some point. It doesn't seem like a lot, but I've been preoccupied of late with a packed work schedule and something else big that I'm not quite ready to talk about out in the big, wide open world. Hopefully an update soon, though! Later this week I hope to have a yarn p*rn update, too! Ooooh, I love the beginnings of your Mystery Stole. I didn't sign up, but it's fun to see them all around blogland. Your stole is looking beautiful so far! Wow! What a lot you've gotten done. 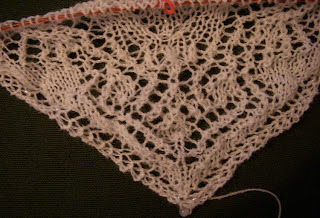 I'm at about row 60 something on the mystery stole, and I'm lovin' lace. I finally get the appeal of it. Now you've peaked my interest. Hmmmmm, an announcement coming??? ?